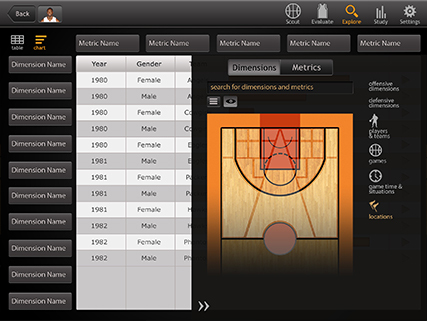 This app is an iPad app for professional basketball players, their trainers, and managers. The biggest challenge for this app was to take huge amount of server-side analytical data and present it to a non-technical user in a compact easy-to-use interface. The Scout portion of the app is for pre-game preparation. 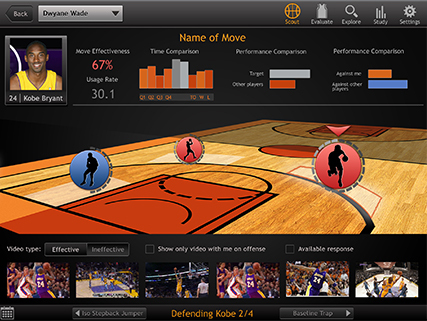 The user looks at a 3d model of the basketball court, can navigate the court (by tilting iPad up-down and left-right) and view crucial data points directly on the court. They can click any of the data points to see opponent's strengths and weaknesses at that point, frequency of various plays at the point, playback video segments that illustrate player performance at that point in prior games, etc. 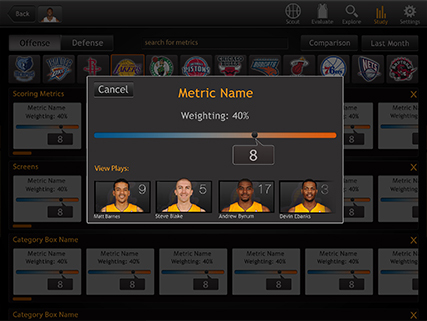 The Evaluate portion of the app is for post-game analysis. 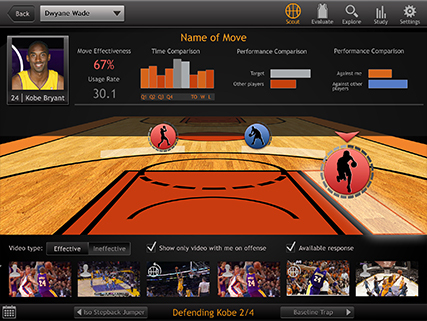 It shows second-by-second video playback of the game, with analyst's comments scrolling vertically on the right and visual representation of game performance scrolling horizontally on the bottom. 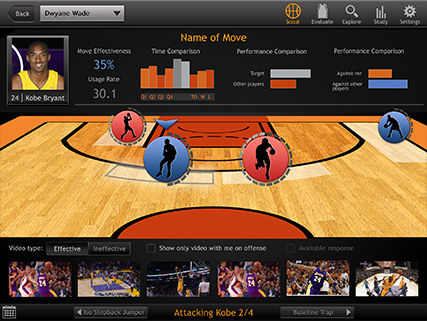 User can select any significant event in the game to see more details about it (such as bar-chart and circular bar chart of player moves and opponent actions). This app illustrates our ability to take large amount of complex data and present it on an iPad interface in an easy-to-use intuitive UI. This app is distributed to professional athletes and scouts.